President Clinton's speech quote above captures the injustice that dominated America in the 1950's, namely Little Rock and the 1957 Central High desegregation crisis. In 1954, the United States Supreme Court, in the Brown v. Board of Education of Topeka Kansas decision repudiated the Plessy v. Ferguson decision of 1896 which served as the basis for the systematic racial segregation of schools. In response, Little Rock Superintendent Virgil Blossom put together a plan for the gradual desegregation of the district’s schools. Though the intention was, to begin with the elementary schools, opposition from white parents and Arkansas Governor Orval Faubus prompted a change to Little Rock Central High School in the fall of 1957. Nine black students, mentored by the head of the Arkansas NAACP Daisy Gatson Bates, were selected for admission into Central. Originally Bates had planned for the students to meet beforehand, but Eckford’s family did not have a phone, and she did not receive the message. And so, on the morning of September 4, she attempted to enter Central High School alone, only to be confronted by a crowd of angry segregationists, the press, and the National Guard under orders from the Governor to prevent her entry into the school. Photographer Will Counts of the Arkansas Gazette took a now iconic photo of Eckford in front of the angry crowd. Turned away from the high school, she went to the bus stop where she was consoled and protected by New York Times reporter Benjamin Fine and civil rights activist Grace Lorch. The Brown v. Board of Education Case took place during the administration of President Dwight D. Eisenhower. Digitized records at The Eisenhower Presidential Library’s website provide more insight into the Brown v. Board of Education Case. On May 17, 1994, President Clinton attended a question and answer session with students at Martin Luther King Middle School about the case. 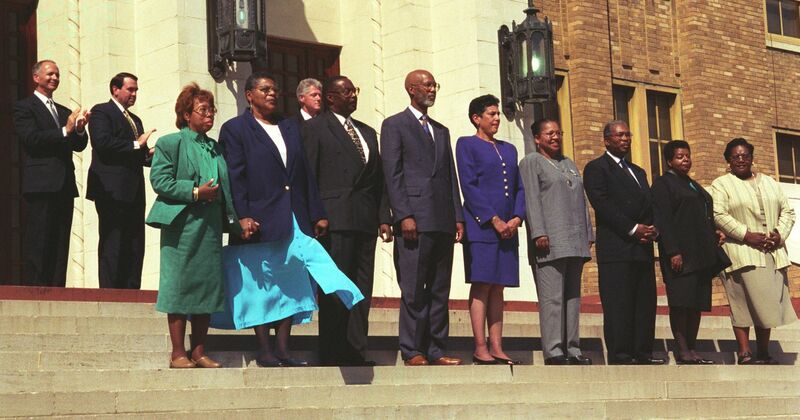 Ernest Green, a member of the Little Rock Nine, accompanied him. The desegregation of Little Rock Central High School took place over several years. A timeline of the entire crisis is available from the Central High School National Historic Site website.